Proper installation is very important to a professionally finished product. A Wild Sign Company works with an installer who will register Call Before You Dig to clear any issues with utilities before the job is done. Having a utility truck with a 6 ft long drill bit that is 20 inches in diameter there is no need to do a standard concrete pour. A pneumatic tamper does the hard work to guarantee a solid installation by compressing the soil around the posts. The sign itself is then leveled when mounted between the posts. 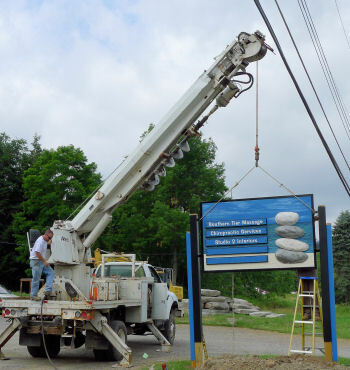 A Wild Sign Company uses an installer with professional grade equipment to ensure our customers of a correct installation to maximize the life of the size and to protect your investment. Many people feel that they can reduce their cost by installing themselves. While it may seem easy to “just dig some holes and put in the posts”, a sign must be installed level with the posts parallel to each other. Not only is this damaging to your company image, it can lead to other issues. Doing new signage panels on existing construction can pose special problems. With the example right, you can see that the posts are getting old and suffering issues with sturdiness as they are starting to tilt, twist and lean. This is an issue that can damage your new sign and it is quite likely that this structure can fall and damage someones property. Hopefully this will not be the case and any harm can be avoided. If time is not taken to ensure the posts are square to one another warping of the sign panels are likely to occur. Wood panels can take the stress of pulling but newer materials such as HDU (high density urethane) are not able to take constant pulling from the fasteners possibly separating from the mounting brackets leading to a future repair. A Wild Sign Company can show you how easy it can be to have a professional installer take care of your hand-crafted sign. The investment of a few hundred dollars initially can help spare years of issues down the line. Let us help you get the job right, at the beginning, in a fraction of the time hand-digging can take!